If you are a photographer by profession then you require an Image Resizer application to resize your large resolution images. This is a unique tool which helps to resize your images and convert them as required. Mostly people go for a complicated application for resizing purposes like Photoshop. 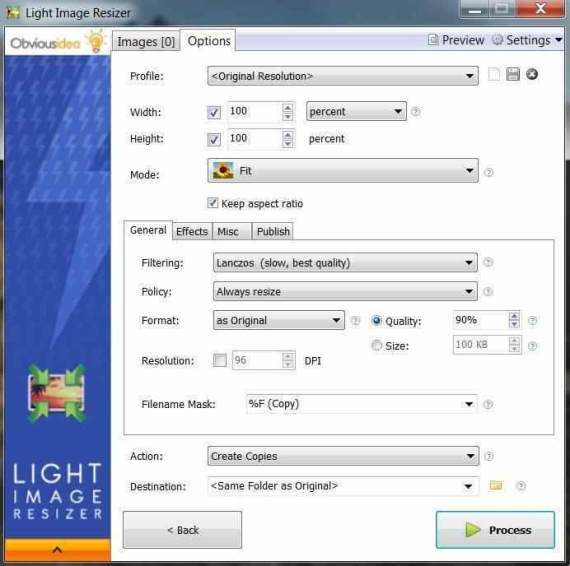 If you want to resize and convert images in an easy way then you must required this light Image Resizer which lets you do want you want with your images easily. This application simply convert your images in any size, format and resolution. Also you can add as many images and resize them in a bulk. Its available for free download on the Internet and available for Window extenuation. Sometimes you have to share your images which are captured by your digital camera or SLR. The size of these type of image is very high, for example if you have clicked from a camera of 12 Mega Pixel of 4000×3000 pixels resolution the the size of image must be between 4MB – 8MB. This is a very large size to upload in image uploading sites or social sites like Facebook and Twitter. You can play with the size and resolution of your images with this smart tool. Lets have a look on this cool image resizing application. You will find some key features and system requirements for this Light Image Resizer Software. 1. Gives better quality to your images after resizing and converting. 2. Inbuilt high quality filters like cubic and lances quality. 3. Can resize and convert images in Bulk. 4. You can add a watermark or rename your images for security purposes. 5. Inbuilt pdf creator for your images to convert your JPEG format images to PDF. 6. Its a fast application which can resize 100s of images in seconds. 1. Any processor of 1.1 Ghz or Higher recommended. 3. Supports Windows XP, Vista and 7 of 32-64 bits. 4. No Graphic Card required. There are many extra settings in this application which you can use on your images. Simply get this application from the this link and start doing lot of things with your images. Also there is an extra feature of saving your images. You can easily save your images as email attachments or a ZIP Compressed File. Hope you like this info about image resizing. Have a nice day!